While testing the new header on trunk, I noticed that the actions on the header are purple. They should be the same colour as the rest of the app. This is a toolkit bug we must address in Palette. is the solution to never use the SuruGradient theme? Looking to the attached image seems the application has a gradient background by having a footer colour specified different from background colour. This means that the theme autoselection is choosing SuruGradient theme, which is a deprecated one not maintained at all. So after having tried the workaround and having talked to Zsombor about why it fails, we'll have to go for setting no gradient until the toolkit bug is fixed. Discussed with Jounih, and we will make the default panel overflow 10% lighter than the header background color, and eventually make the panel color configurable (probably using a style). Do these colors (Qt.lighter(headerColor), 1.1) make sense for the panels? 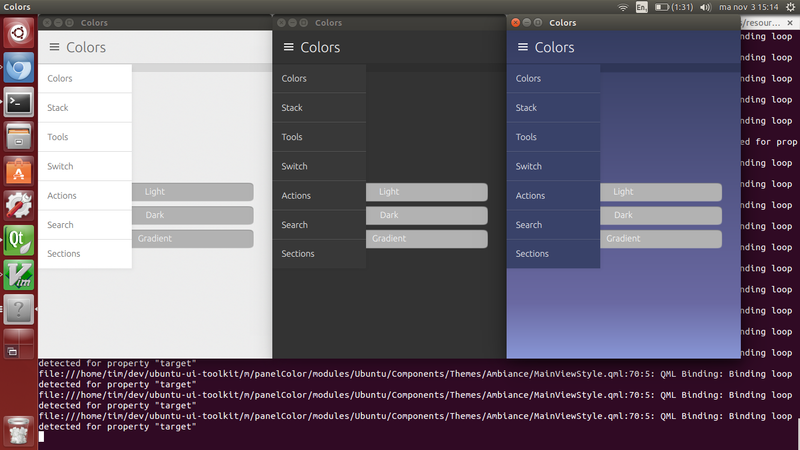 Added ubuntu-ux project because they are involved in the discussion what the actual panel color should be. I'm proceeding with these colors.